This Light Smoked Salmon Dip is delicious, healthy, and gluten-free, full of ricotta, greek yogurt and herbs. Perfect appetizer to satisfy salty craving. Am I the only one not interested in sports? Sometimes I feel very alone in my disinterest, but sports were never part of my family ritual when I was growing up. Last fall when Blue Jays were playing and Toronto was swept by the blue fever, A. and I happened to have dinner at a pub. I kept interrupting the game by asking questions. Is it a goal? Is it a foul? At some point I attempted to sing “Ole-ole-ole-ole” song during the baseball game. My husband started to pretend that he didn’t know me. I genuinely thought that the song could apply to any sporting events, apparently I was mistaken. And now it’s time for the Super Bowl. I had to google it to be honest. But from what I understand, it’s a big deal. And it’s celebrated with a special kind of super bowl food: cheesy, gooey, salty, unhealthy, delicious. Snacks and appetizers for some reason are official foods for that weekend. I wouldn’t be a proper food blogger if I didn’t post at least one appetizer/snack recipe before the event. However, I decided not to go the cheesy and unhealthy route. I created a delicious Light Smoked Salmon Dip that will satisfy the salty craving, but will not leave you feeling tired, full, and sleepy. 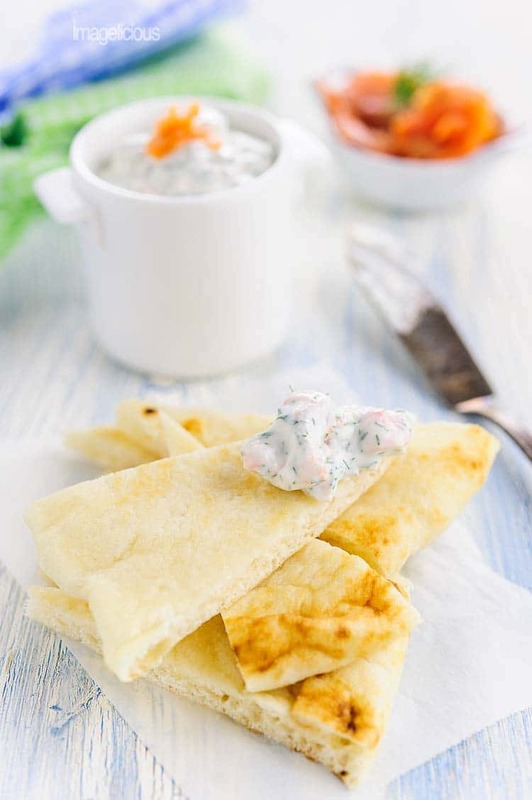 It’s filled with light ricotta, healthy non-fat greek yogurt, and bright summery dill. It still has to have a bit of indulgence, so there’s cream cheese as well. And, of course, delicious smoked salmon. 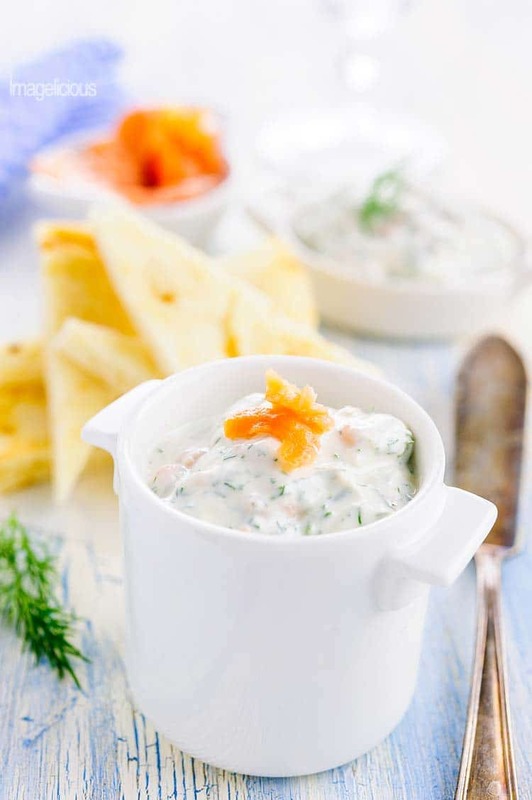 The Light Smoked Salmon Dip comes together in a food processor in a matter of seconds and goes well with healthy toasted pita, crackers, refreshing cucumber slices, or sturdy potato chips (because who are we kidding? it can’t all be healthy!). Smoked salmon can be expensive, so I like using it as an ingredient in other recipes to stretch it out and make the meals extra special, yet affordable. I love making dips healthy. Try my Cottage Cheese Dip for another delicious and healthy appetizer. 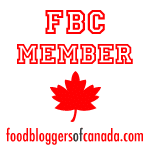 In a food processor combine the ricotta, greek yogurt, and cream cheese, process until smooth. Add the dill and smoked salmon and pulse for a few seconds until both dill and salmon are incorporated, but still in pieces. 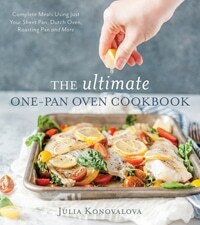 Serve with pita chips, crackers, cucumber slices, or potato chips. It might be a bit too thin right after mixing, but it’ll thicken a bit in the fridge. 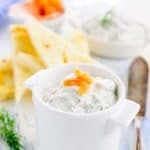 WOW I am the biggest fan of smoked salmon so this dip is one that I need to make really soon!! Oh, Julia, I’m so with you in terms of sports. Couldn’t care less lol But I love all kinds of sport snacks, dips and appetizers! I think this healthy and easy dip is perfect for a game night, plus there is smoked salmon so gimmmme me!